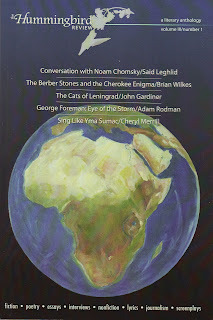 The Blue Marble visage of the globe with the African continent at its centre as portrayed on the cover of the latest edition of the Hummingbird Review serves as a statement of intent. The Review, which according to publisher Charles Redner, is committed to “portraying the beauty and challenges of life through literature and art” as well as promoting “cross cultural writing in all forms” is indeed a smorgasboard of literary modes and devices; providing a forum for both established as well as neophyte figures. Here, poetry is presented alongside journalism as are lyrics and screenplays with the theme of this edition being largely to do with Africa. Redner’s thoughtful preface is headlined in the Shona language of southern Africa and, true to its stated intent, the content spans different regions of the continent. The inaugural piece features an interview with Noam Chomsky conducted by Said Leghlid, a Moroccan-born American, in which the venerable intellectual voices his characteristically insightful and vehement analysis of United States foreign policy, this time in regard to the Arab Spring which of course started in North Africa. Among the poetical selections is The Cloud, an 1835 work by Alexandre Pushkin, the acknowledged father of Russian Literature who was the descendant of Abram Gannibal, a general of the Russian Empire who may have been of Eritrean ancestry or with roots further west in modern day Cameroon. Among the eye catching works are The Berber Stone and the Cherokee Enigma, an essay which postulates the migratory connections between North Africa and the Americas via oral histories handed down through the mists of time, linguistic similarities, archaeological discoveries, and even DNA traits. Also of interest, from this writer’s perspective, is an excerpt from a biographical screenplay on the heavyweight boxer George Foreman. It is centred on the profound transformation in the life philosophy of Foreman; the roots of which germinated from his experiences related to the ‘Rumble in the Jungle’, the legendary heavyweight championship contest he had in 1974 with Muhammad Ali in Kinshasa, the capital city of what was then Zaire, which is now the Democratic Republic of the Congo. If the purpose of literature is to stimulate thought, to provoke debate, to evoke joy and pathos, to educate, and to develop the inherent human thirst for a personal understanding of the stirrings of the inner mind as well as the wider world, then the Review strives to provide some measure of each. This journal genuinely serves as food for the cerebral palate.